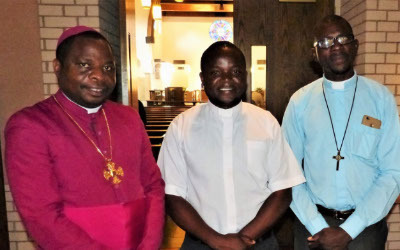 Fort Worth's Bishop Jack Iker and Northern Malawi's Bishop Fanuel Magangani enjoyed the opportunity to visit with each other on several occasions during May and June. 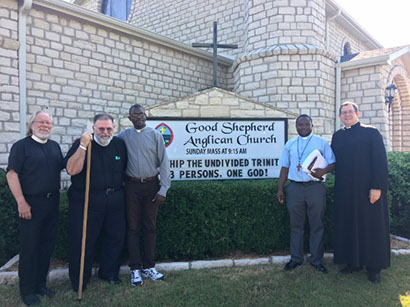 Bishop Magangani traveled to North Texas along with two priests from the Diocese of Northern Malawi. 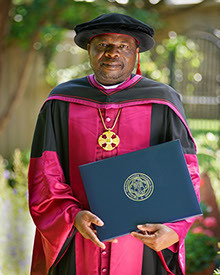 Bishop Magangani successfully completed his doctoral program in Pastoral Leadership and graduated from Nashotah House in late May. 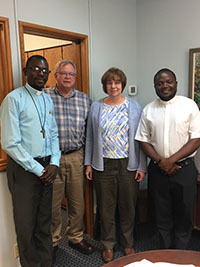 Bishop Magangani is most grateful to St. Andrew's Episcopal Church Fort Worth for their sponsorship and assistance in securing a grant from the Thomas M. and Helen McKee and John P. Ryan Foundation, which made it possible for him to pursue this advanced degree program. 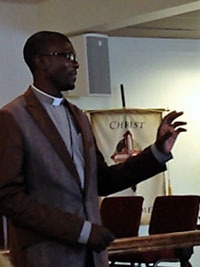 A reception celebrating his graduation took place at St. Andrew's in Fort Worth in May. 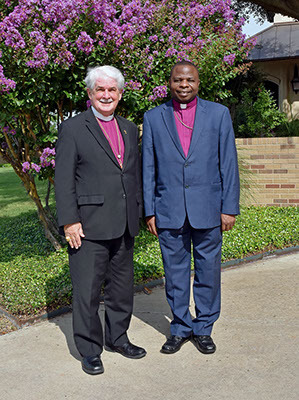 Bishop Fanuel Magangani celebrated a successful visit to Fort Worth in May and June. 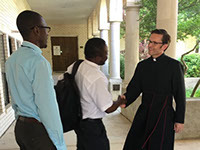 The bishop’s visit was full of activity as he visited with friends, attended graduation at Nashotah House, visited parishes throughout the Diocese of Fort Worth and worked to advance the initiatives of the Diocese of Northern Malawi and grow the companion relationship with the Diocese of Fort Worth. Fr. Edward Juta and Fr. 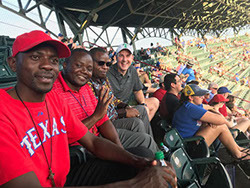 Allan Kandeya also joined the bishop in Texas and spent two weeks receiving training, visiting churches, making presentations, meeting new people and being exposed to Texas life in all of its various forms. Fr. 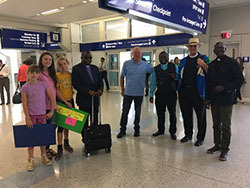 Chris Culpepper and Bill Meyer from Christ the Redeemer along with the Fraser sisters from St. Laurence and others greeted Bishop Magangani and his team at DFW Airport with warms hugs and big smiles as well as a few welcome signs. A welcome dinner was hosted in honor of the Malawian team. 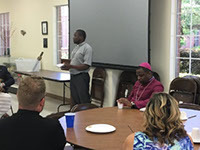 Friends, old and new, from throughout the diocese came for fellowship, good food and fun (and of course, an introduction to the Texas summer heat!). 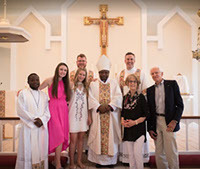 Bishop Magangani celebrated the Rite of Confirmation at St. Laurence Church in Southlake, confirming three and receiving one, in both English and Chichewa, Memorial Day Weekend. 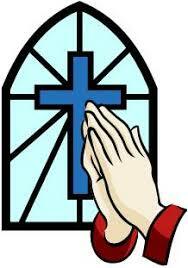 Later in the same day, the bishop confirmed three others at St. Andrew's in Fort Worth. 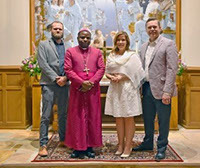 One of the confirmations was a result of a special request from one of St. Laurence's young people who traveled to Malawi last summer as part of a short-term mission. 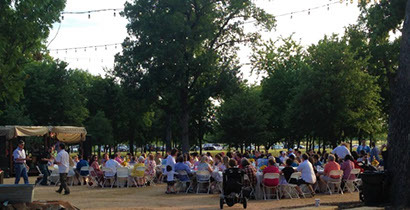 Christ the Redeemer in Fort Worth celebrated its 10th Anniversary with great music and food at the Trailhead at Clear Fork on June 3rd. The Malawi team joined in the festivities through song and fellowship, treating the crowd to some Malawian music. Christ the Redeemer has had an ongoing relationship with the Diocese of Northern Malawi since its inception and has sent several mission teams to Malawi, including a group of 24 members led by Fr. Chris Culpepper during the summer of 2017. Jim and Elizabeth McCoy (left), members of Christ the Redeemer, introduced Fr. 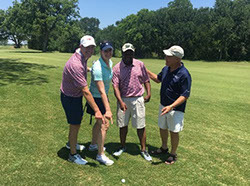 Allan Kandeya to the game of golf at Bishop Iker's Charity Golf Tournament in June. Fr. Scott Wilson (right) teases Fr. Kandeya about finally finding his ball. 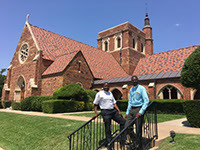 The Malawi clergy continued their introduction to the Diocese of Fort Worth with visits to area churches where they were received warmly by Fort Worth clergy and parishioners alike. Fr. Allan Kandeya and Fr. 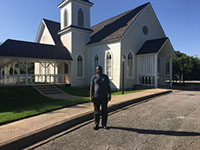 Edward Juta preached, sang, joined in bible studies, toured churches and learned about the parish life of many churches throughout the diocese. 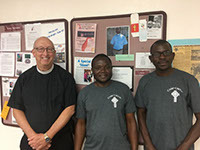 The priests were humbled to see the photos of Centurion priest partners featured in many Fort Worth-area churches and honored to receive vestments and altar serving pieces to take home to share with their churches in Malawi. The tour included visits to the following churches: St. Anne's in Fort Worth, Good Shepherd in Granbury/Acton, Holy Comforter in Cleburne, Christ the King and All Saints in Fort Worth, St. John's in Fort Worth, St. Andrew's in Fort Worth, Christ the Redeemer in Fort Worth, St. Laurence in Southlake and Holy Apostles in Fort Worth. How do you say "cowboy" in Chichewa? Yee-haw! 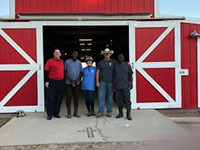 A visit to Texas would not be complete without a visit to a barn and a chance to ride horses! Fr. 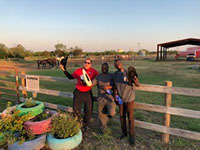 Stuart Smith and Philip Craig arranged for the team at Camp Crucis to set up a tour and trail ride for Fr. Allan Kandeya and Fr. Edward Juta. 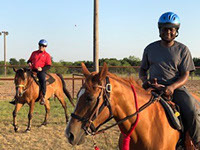 It was their first time ever to ride horses and a memory they won't soon forget! 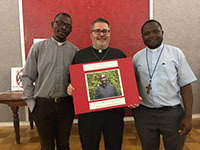 Thanks be to God for the special partnership between the Diocese of Fort Worth and the Diocese of Northern Malawi and for Bishop Fanuel's graduation from Nashotah House.